Do you need concrete repair? If you're experiencing moisture, dampness, trickling or even water pooling in your basement, you probably need our concrete repair services. Basement leaks and floods are more common than you think, and while they definitely present a problem that needs to be taken care of, fixing them doesn't have to be a headache. Our concrete repair is just what you need to turn your basement back into a warm, dry and clean living space. Water damage can have serious effects that go far beyond unsightly pooling and dampness in your basement, so it's very important to address the issue promptly. If you've experienced any flooding, leaking or water seepage in your basement, make the right decision and protect the value of your home. Don't let water damage in your basement spread to other parts of your home, give us a call today! We are certified concrete repair contractors. 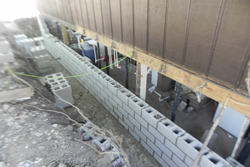 Although your basement was waterproofed at the time of its construction, there are plenty of ways that the persistent presence of water can slowly breakdown the moisture barrier and cause damage that necessitates concrete repair. When your home was built, a large hole was dug in which to lay the foundation, pour the concrete slab, and build up the walls of your basement. 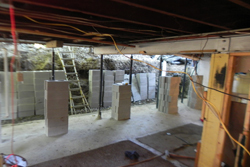 Once your basement was complete, the soil that was dug up was filled in around your basement walls and packed down. This returned soil, often called "back filled soil", is far looser than the soil around it that has been naturally settled for a very long time. Because back filled soil is much looser, it absorbs far more moisture and can act as a sort of sheath of waterlogged dirt around the basement of your home. Constant pressure from this moisture, increased during times of rain and snow, can wear away at your basements waterproofing over time. There's no need to worry, though, our concrete repair can ensure that your basement's moisture barrier lasts and lasts. If you need to have some repairs done to your concrete, give us a call! Water can damage your home in a variety of ways. In addition to its obvious effects on furniture, carpet, stored or boxed goods and the like, it also has some effects that are a little harder to see. Water vapor can seep into drywall or ceiling tiles and cause discoloration, crumbling, and rotting. Water vapor can also seep into the joists in your ceiling, and, over time cause rotting and weakening of the structure. Another adverse effect of standing water or dampness in your home is the growth of mold, mildew or fungus inside and on your walls, furniture and more. The growth of mildew, mold and fungus spores causes a very strong musty smell in the air of your home, as well as contributes to respiratory illness, fatigue and other health problems. If you're experiencing dampness, moisture or pooling water in your basement you can be sure to expect water damage in your house. While water pooling, water leakage and water seepage may seem like temporary problems during seasons of snow or rain, you can bet that they'll lead to expensive repairs and serious headache. Concrete repair is an excellent way to preserve the value of your home as well as protect the health of yourself and your loved ones. Not only will you be able to store boxed goods in your basement again, you'll be able to convert your basement into a dry, beautiful and usable space, as well. Give us a call for your concrete repair needs today! We are second to none in concrete repair.